Dr. Timothy Volk, a senior research associate in the ESF Department of Forest and Natural Resources Management, and Ph.D. candidate Obste Therasme represented ESF at the Advanced Bioeconomy Leadership Conference on Next Generation Technologies (ABLC Next), a conference dedicated to the most important issues in the bioeconomy. They were among more than 40 student delegates, faculty mentors and leadership team members of the Consortium for Advanced Bioeconomy Leadership Education (CABLE) who gathered for the meeting in San Francisco, California. CABLE is a nationwide organization of universities focused on training students to pursue leadership positions in bioeconomy-related careers. The Ohio State University is leading the program and overseeing a $2.8 million grant from the U.S. Department of Agriculture (USDA). Therasme is one of 20 student delegates, aided by faculty mentors, who are spending a year in leadership training that includes one-on-one mentoring with current industry leaders, feedback on career preparation and academic training, internship and externship opportunities, and workshop and conference participation. 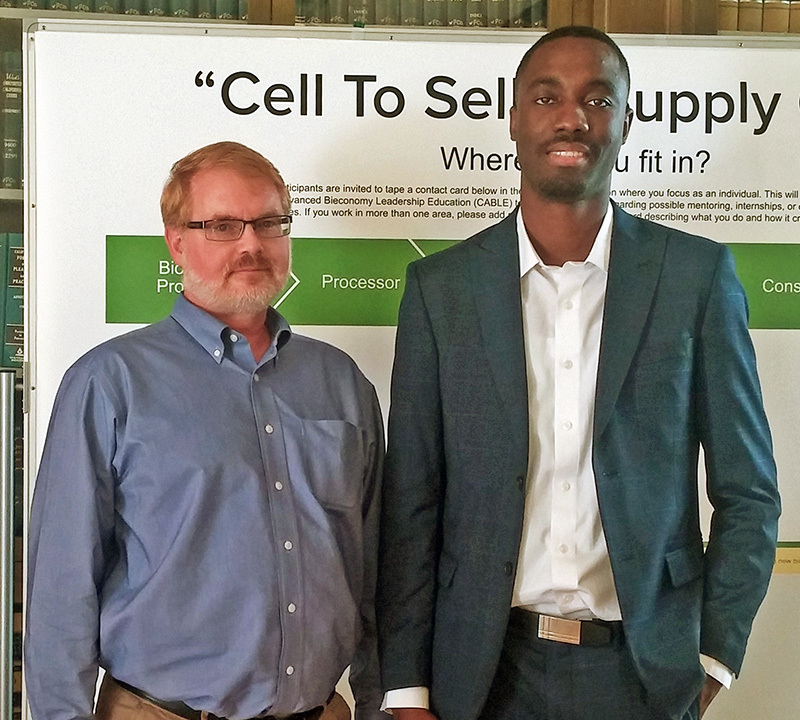 During the conference last month, Volk and Therasme had an opportunity to connect with bioeconomy industry professionals while furthering the CABLE program goal of leadership education. ABLC Next aims to be an action event with unparalleled networking and visualization. It's a place where industry professionals within the emerging bioeconomy can discuss the latest technology and trends. The conference has special value for CABLE student delegates, who seek to learn more about the bioeconomy and become industry leaders. A key benefit for the CABLE group in attending ABLC Next was meeting high-ranking executives of top bioeconomy companies and government agencies, including LanzaTech, DSM, Aemetis, the USDA and the Department of Energy. CABLE was created to develop bioeconomy industry leaders who will be ready to fill bioeconomy careers. Those future jobs include positions as chemists, engineers and scientists. Program Director Dennis Hall of The Ohio State University, notes, "The advanced bioeconomy is critical to a more sustainable future for society but largely invisible to all but few college students. The ultimate goal is to equip more students with the knowledge and leadership skills necessary for successful biobased enterprises." CABLE student delegates have been split into four Working Groups that align with their educational background and professional goals. Therasme is part of the State of the Industry Working Group led by two facilitators from the CABLE leadership team. Therasme met his group at ABLC Next and was provided the first of many leadership development training sessions that will occur throughout the next year. As Therasme and this current cohort of CABLE student delegates progress throughout the year, they will continue to have close interaction with and receive support from bioeconomy professionals. CABLE is intent on expanding the leadership education of students and aiding them in achieving their goals.